Nerve cells in the brain pass signals among themselves using both electrical current and chemicals. In a seizure, the brain's electricity is not passed in an organized way from one cell to the next, but spreads over a cluster of cells or the whole brain all at once. 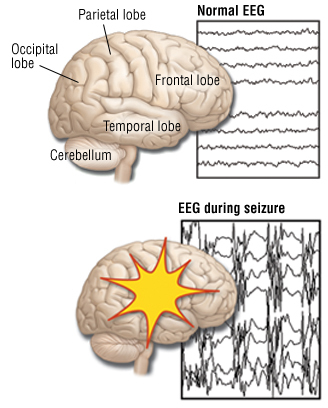 When only a portion of the brain is involved, the seizures are called partial seizures or focal seizures. These seizures vary tremendously in their effects on the person's movement, sensation or behavior depending on which area of brain is involved.